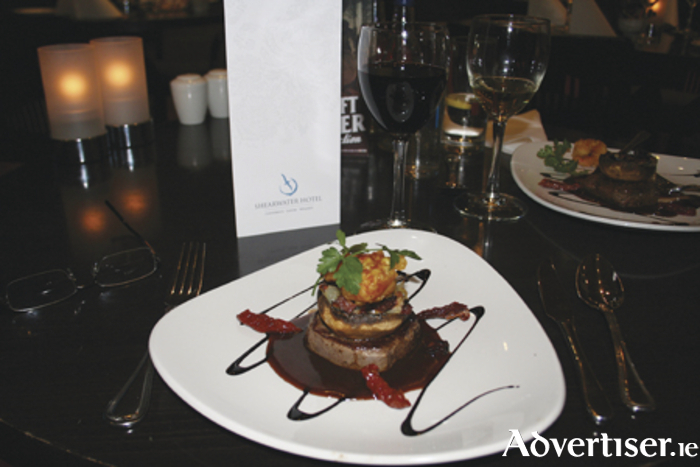 I was recently invited to a tasting of the new menu in the Canal Gastro Bar and Bistro, Shearwater Hotel, Ballinasloe. On entering the lobby of the hotel one cannot help but be impressed. Tall ceilings and marble finishing immediately suggest style and class, without making me question my decision to go with a casual shirt and pants combo. My hostess for the evening, the charming and welcoming Soroya, immediately puts me at ease as she leads me to my table. Smiling and courteous, she is also a treasure trove of information regarding the food I am about to eat and about the establishment itself. The restaurant is large but still incredibly cosy; the modern décor is enriched with warm and inviting earthy tones. Large windows brighten the room with the best of the evening light. Two kinds of homemade bread quickly appear at the table. The first course is chargrilled chicken and chorizo. Sun-dried tomatoes give the meal a sweet flavour contrasted with tasty chorizo. The chorizo flavour really shines through without being too overpowering. This is a blending of flavours that works really well. The next dish is camembert cheese wrapped in kataifi. I am told it is the one that brings people back here time and again. Placed in front of me, it appears as a work of art first and only a meal after. A light kataifi pastry deep fried and cut into fine threads, woven together into a circular ball, containing warm, runny, camembert cheese within that melts in the mouth. Cubes of quince and blood orange oil provides the sweet taste, while roasted walnut and sakura herbs draw it all together. The third and final starter is an old classic: smoked salmon. Head chef Gary Murphy serves the fish with creamed crème fraiche and tarragon, beetroot purees, gin-soaked cucumber, blood orange and lemon jelly. I know I should be pacing myself with more courses to come, but it is difficult to leave the fork down. The first main is stuffed corn fed chicken breast loaded with a wild mushroom and tarragon stuffing, wild garlic and chive crushed potato, glazed baby vegetables, and a truffle cream. Again, the meal encapsulates a variety of tastes, with the truffle cream in particular pleasing to the palate. Next up is the Shearwater surf and turf: steak with pancetta and parmesan-stuffed mushroom under a deep fried tempura prawn, with sun-dried tomatoes, rosemary scented onions, button mushrooms, and a balsamic glaze. The steak is cooked to perfection; the glaze giving it an amazing savoury taste. Chef Gary enjoys experimenting with different flavours in the same dish, and boy does he make it work. The pancetta and parmesan-stuffed mushroom is a treat in itself. Oven-roasted fillet of Atlantic salmon arrives next. The fillet of salmon sits on a bed of bay leaves swimming in a rich chard and vanilla sauce with bacon lardons scattered alongside. The taste and texture of the sauce makes the meal, providing a sweet infusion to the salmon. Then we turn to the desserts: mouthwatering smashed raspberry and white chocolate panna cotta; and Banoffi pie comprising a biscuit and almond base with mascarpone, cream, toffee, and banana topping. Warm chocolate pudding with cream, strawberry, and ice-cream, topped off with a Nutella-infused profiterole, immaculately presented, rounds off a great evening. I leave the Shearwater extremely satisfied, and with plans to return in the near future. This is a restaurant, chef, and catering staff who are passionate about food and showcasing local produce with a touch of flair. Gary Murphy has built a strong team of passionate chefs who share his culinary vision. The service was impeccable; the staff friendly, attentive, and well-informed. All dishes are complemented by carefully selected wines. Just ask a member of staff to recommend one. There is also a great selection of craft, gluten-free, and organic beers to choose from. The Shearwater Hotel is located at Marina Point, Ballinasloe. The Canal Bar and Bistro is open Monday to Thursday from 3pm to 9.15pm; Friday and Saturday from 3.30pm to 9.45pm; and Sunday from 4.30pm to 9.15pm. For more information, visit www.shearwaterhotel.com Alternatively, call (090 ) 9630400.